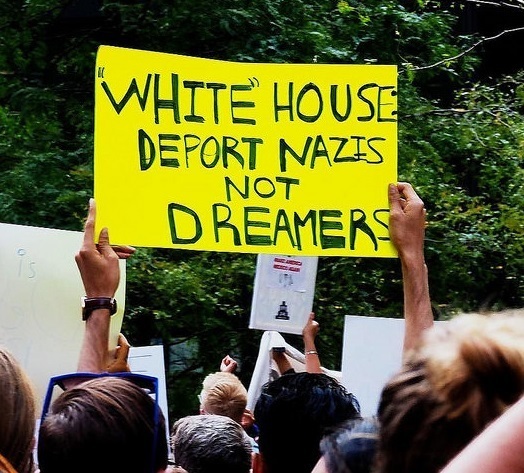 Pro-immigration protesters hold up a sign: "White House: Deport Nazis Not Dreamers." Chicago, September 2017. By Christian Werthschulte. So writes Carolyn Alessio, an author and an English teacher at Chicago's Cristo Rey Jesuit High School, in her moving essay "Sanctuary, City." The essay was published in the journal Scoundrel Time more than a year ago, but still, sadly, continues to be relevant. Alessio writes about her students, mostly of Latinx origin, the new fears with which they now live, and the connections they make to literature about authoritarianism and resistance. In addition to Elie Wiesel's Night, Alessio discusses Orwell's Animal Farm and Homer's Odyssey, with its broad affirmation of hospitality: "Everyone in the poem, from prince to swineherd, must welcome the most ragged strangers into their homes." To read the entire essay, visit Scoundrel Time. For contemporary literature on immigration and deportation, available on this website, try The Gringo Champion, The Bed, or Pears from Gudauty. You can also search for other works by using the "Leaving Home" filter on the Find page. And let us know: what connections between literature and "real life" are your students making this year?